Did I miss a step? It looks like he plays around with some wires, but I don't think that should affect it. I used multiple layers of stickers, but I don't think that should make it this dim, especially since a bit of the tachometer is a fair bit brighter than everything else. Maybe they fell off? I'll of course be taking it out again soon to find out. It would be nice if I could find a fix. 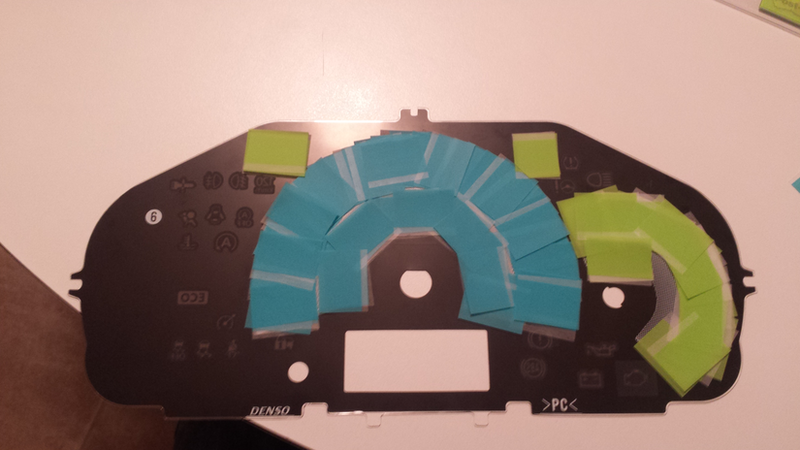 I'd really love to change the colours without having to solder new LEDs in. Shame, I had a real nice write-up planned! I've seen multiple people change the colour, but no real thread about how. I was surprised in the pictures that I saw that orange light behind, let's say, blue would produce such a pure blue. Obviously, that is not the case. I think strips of white LEDs were added behind the speedometer and tachometer. I did not use a LED strip.. I opted to change the LED's at the tachometer and speedometer sections. 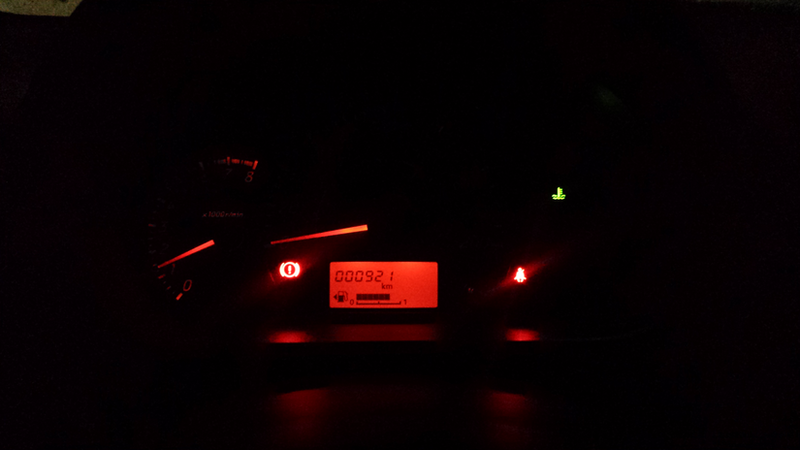 Here's how my instrument panel lighting looks like. Damn, I can see that in the pics now. He used white LEDs (like daleWV said), I assume? Why not just change the bulbs like you did, I wonder...lookin' good, by the way. I'm too afraid of messing up the circuit board to solder it. Last edited by nickpon; 11-03-2015 at 09:44 AM. You have to be very careful in soldering the SMD LEDs .. I've destroyed a few during the soldering process. The Love Attrage model is easier to implement IMO but you have to splice the wiring.. Damn. Not sure what I'll end up doing, then. Not feeling the orange. I have to agree orange and red really dont get along with my eyes at night. Takes me a minute to adjust to see them. Really wish this car came with blue dash lights! Red lighting is supposed to preserve nightvision. Had some trouble with the gauge needles too...a few seconds after leaving my house, it read 70kph when I was probably going about 25kph By the time I got to school it was reading 180kph while idle. Took it apart and mostly fixed it. It reads about 2kph now when I'm idle. Probably won't bother to experiment with it anymore in fear of it getting broken. Dammit. Don't know what to do with the rest of the interior now. I've got blue footwell LEDs to go in, but I don't want too many colours. It'd be nice for everything to match. Is it this difficult to change the colour in other new vehicles? For my 1995 they're just simple push-in/pull-out bulbs. I'm considering painting the bezel. I bought an insert one for my old car (this one), but the one on the Mirage is a separate piece so it can be removed and painted. Just need to find the right paint. Maybe PlastiDip. Last edited by nickpon; 11-03-2015 at 10:36 PM.